"Latka" redirects here. For other uses, see Latka (disambiguation). Potato pancakes, draniki, deruny, latkas, raggmunk or boxties are shallow-fried pancakes of grated or ground potato, matza meal or flour and a binding ingredient such as egg or applesauce, often flavored with grated garlic or onion and seasoning. They may be topped with a variety of condiments, ranging from the savory (such as sour cream or cottage cheese), to the sweet (such as apple sauce or sugar), or they may be served plain. The dish is sometimes made from mashed potatoes to make pancake-shaped croquettes. Some variations may be made with sweet potatoes. Potato pancakes are associated with the cuisines of many European traditions including German and Austrian (as Kartoffelpuffer, Reibekuchen, Reiberdatschi, Erdäpfelpuffer and Erdäpfellaibchen), Dutch (as aardappelpannekoek, reifkoeken, reifjes), Belarusian (as дранікі draniki), Bulgarian (as patatnik), Czech (as bramborák or cmunda), Hungarian (as tócsni and other names), Jewish (as latka, Yiddish: לאַטקע‎, Hebrew: לביבה‎ levivah, plural לביבות levivot), Latvian (as kartupeļu pankūkas), Lithuanian (as bulviniai blynai), Luxembourg (Gromperekichelcher), Polish (as placki ziemniaczane), Romanian (as tocini or tocinei), Russian (as драники draniki), Slovak (as zemiakové placky), Ukrainian (as деруни deruny) and any cuisine that has adopted similar dishes. It is the national dish of Belarus and Slovakia. In Germany, potato pancakes are eaten either salty (as a side dish) or sweet with apple sauce, or blueberries, sugar and cinnamon; they are a very common menu item during outdoor markets and festivals in colder seasons (especially at Christmas markets). In Swiss cuisine, Rösti is a variation that never contains egg or flour. Potato pancake is a traditional favorite in the southern parts of Indiana during holiday festivities. 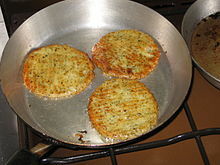 Potato cakes are common in the United Kingdom. In the North-East of England (particularly County Durham), there is a dish known as tattie fish, because the pancake resembles a deep fried piece of fish. The pancake consists of flour, eggs, shredded potatoes and onions. Some people add tomato or cheese to the mix, depending on taste. The British also brought the potato pancake to former colonies such as Zimbabwe. They are still eaten today, where they are an affordable dish. A form of potato pancake known as boxty (Irish: bacstaí) is a popular traditional dish in most of Ireland, particularly north Connacht and southern Ulster. It is made similarly to the British type, with more starch and often with buttermilk and baking soda. It has a smooth, grained consistency. "Latka" redirects here. For the children's book, see Latke, the Lucky Dog. Latkas or latkas (לאַטקע) are potato pancakes that Ashkenazi Jews have prepared as part of the Hanukkah festival since the mid-1800s, based on an older variant of the dish that goes back to at least the Middle Ages. Latkas need not necessarily be made from potatoes. Prior to the introduction of the potato to the Old World, latkas were and in some places still are, made from a variety of other vegetables, cheeses, legumes, or starches, depending on the available local ingredients and foods of the various places where Jews lived. Numerous modern recipes call for the addition of ingredients such as onions and carrots. Daily variations on a simple potato latka might include zucchini, sweet onion and gruyere (for french onion flavor) and some variations made with sweet potatoes. The word latka itself is derived (via Yiddish) from the East Slavic word ladka, oladka, a diminutive from oladya (оладья), "small pancake". The word leviva (לביבה), the Hebrew name for latka, refers in the Book of Samuel to a dumpling made from kneaded dough, as part of the story of Amnon and Tamar. Some interpreters have noted that the homonym levav (לבב) means "heart," and the verbal form of l-v-v occurs in the Song of Songs as well. In the lexicon of Ashkenazi Jews from Udmurtia and Tatarstan there are recorded versions of the kosher-style appellation of latkas (draniki, dranki, krezliki, kremzliki, kakorki, etc.) during the eight-day Hanukkah holiday. Gamja-jeon (감자전; lit. "potato pancake") is a Korean pancake made by pan-frying in oil the mixture of grated potato and potato starch. It can be made without additional ingredients, but is sometimes mixed with onion, chilli and perilla leaf. Generally, it is seasoned with a small amount of salt and served with soy sauce. There are four Swedish version of potato pancakes. Raggmunkar are prepared with a pancake batter of wheat flour, milk and egg, into which shredded raw potatoes are added. They are fried in butter and look like crêpes (i.e. thin pancakes). Potatisplättar are also made of pancake batter and shredded potatoes, but the potatoes are cooked before they are shredded. Rårakor are a variant more akin to hash browns and rösti, i.e. shredded raw potatoes formed as thin pancakes, but without any batter, which are fried in butter. Potatisbullar are rather thick pancake-like patties of mashed potatoes and eggs, which are turned in breadcrumbs and then fried in butter. Can be bought ready-made in Sweden. All four variants are traditionally served with fried unsmoked bacon and lingonberry jam. Potato pancakes, literally translated in Polish as placki ziemniaczane, are often served in Poland topped with meat sauce, pork crisps or goulash, as well as sour cream, apple sauce, mushroom sauce, and cottage or sheep's cheese or even fruit syrup. Placki ziemniaczane was a food staple at the 17th-century Polish monasteries according to written recipe from Stoczek Warmiński with one onion, two eggs and a spoonful of wheat flour per each kilogram of potatoes, served only with salt and pepper. 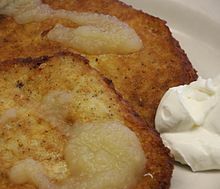 In the 19th century, especially in times of economic difficulty during the foreign partitions, potato pancakes often replaced missing bread among the peasants. The lower-quality crops given to field laborers were sometimes turned by them quickly into pancakes to improve taste and prolong freshness. Also, their popularity is closely associated with the historic presence of one of the largest Jewish communities in the world flourishing in Poland. 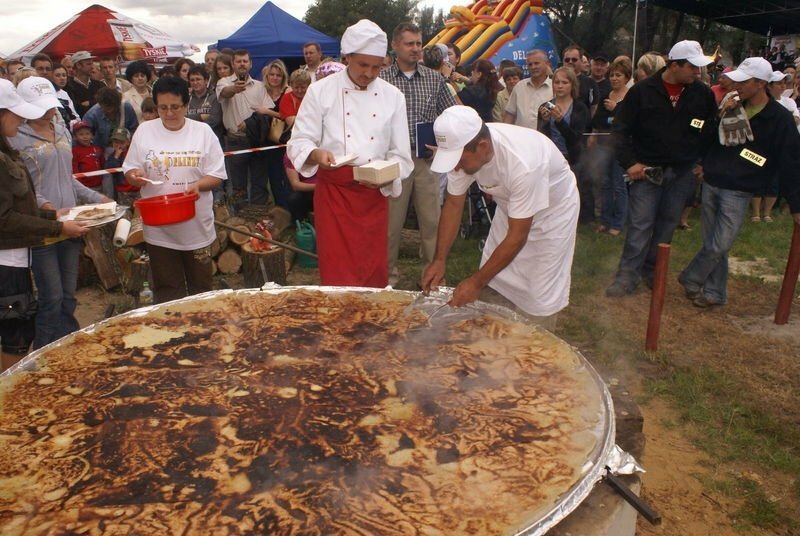 The largest potato pancake (possibly in the world), measuring 2 meters and 2 centimeters, was made during the annual two-day celebrations of Świt Plinzy (Plinza Dawn festival) in Rzechta, Poland (see photo). The tongue-in-cheek games in Rzechta include the throwing of bad potato pancake, with the record of 29 meters. A Czech potato pancake is called bramborák (from brambor, potato) and it is made of grated potatoes with egg, breadcrumbs or flour and seasoning (salt, pepper, most importantly garlic and marjoram; sometimes ground, cracked or whole caraway seeds) and is served as it is. Some regional versions blend in dough, sauerkraut or sliced smoked meat. The same potato dough is used also as coating of fried pork chop called kaplický řízek. It is sometimes deep fried. In Iranian cuisine, kuku sib-zamini (Gilaki: کوکو سیب زمینی‎, "potato kuku") is made with shredded potatoes, eggs, onion, saffron, sometimes garlic chives and sometimes cinnamon. 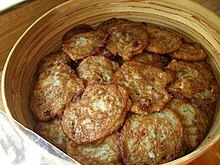 Frequently, potato kuku is cooked as smaller patties, but it is also cooked in a larger pancake-style or baked. This dish has been compared to the latke, Rösti and tortilla Española (Spanish omelette). ^ "Mashed potato pancake recipe". All-about-potatoes.com. Retrieved 2011-12-25. ^ Moose, Debbie (2014-09-15). Southern Holidays: a Savor the South® cookbook. UNC Press Books. ISBN 978-1-4696-1790-9. ^ "Sweet Potato Latkes, 2 Ways". Food Network. Retrieved 2018-11-08. ^ "Potato pancakes recipe at "Whats Cooking Dad?"". Whatscookingdad.com. 2009-01-06. Archived from the original on 2012-02-20. Retrieved 2011-12-25. ^ "News Quiz: Special Holiday Edition". 2011 Southern Indiana Current Magazine. Retrieved December 8, 2011. ^ Koenig, Leah. Modern Jewish Cooking: Recipes & Customs for Today's Kitchen. Chronicle Books. p. 119. ISBN 9781452132327. Retrieved 22 December 2015. ^ Marks, Gil. Encyclopedia of Jewish Food. Houghton Mifflin Harcourt. p. 707. ISBN 0544186311. Retrieved 22 December 2015. ^ "Discover the History of Latkes - PBS Food". 12 December 2011. ^ Appelbaum, Yoni (11 December 2015). "Everything You Know About Latkes Is Wrong". The Atlantic. Retrieved 22 December 2015. ^ Rachel Ray, Quick Potato and Carrot Latkes, The Food Network, December 20, 2008. ^ Philip and Karen Selwyn, Potato-carrot-onion Latkes, rec.food.cuisine.jewish archives, Oct. 11, 1998, 1:00 AM. ^ "The only latke recipe video you'll ever need". JTA. 1 February 2019. Retrieved 1 February 2019. ^ DLC (2006-12-18). "Analysis of the word "latke"". Balashon. Retrieved 2011-12-25. ^ "Placki ziemniaczane". Kącik kulinarny (in Polish). Szlak Pielgrzymkowy - Święte Miejsca Warmii. Retrieved December 31, 2012. ^ "Wysmażyli największy placek ziemniaczany świata" [They made the largest pancake in the world)]. Święto plinzy Rzechta 2011 in Echo Turku (Plinza holiday in Rzechta) (in Polish). Wydawnictwo - Przegląd Koniński (publishing). August 2011. Retrieved December 31, 2012. ^ "Kuku-ye Sibzamini (Potato Patties)". Vida Vitality, Bad Assing it All The Way. VidaVitality.com. March 25, 2014. Retrieved October 13, 2014.